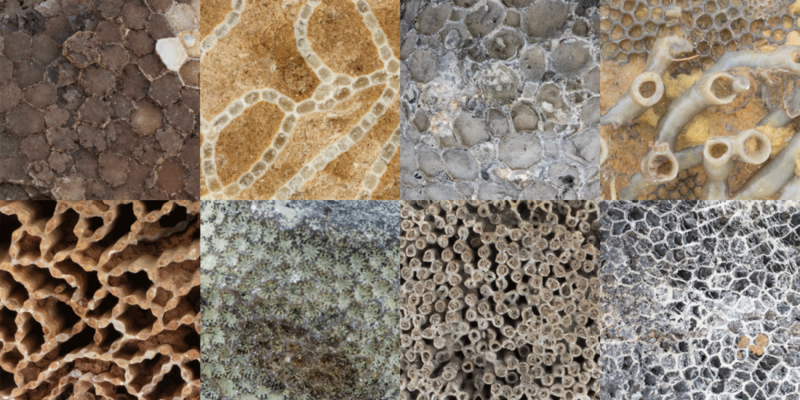 Above: Examples of different types of tabulate coral fossils. Class Tabulata--the "tabulate corals"-- originated in the Early Ordovician period and went extinct at the end of the Permian period. All tabulate corals were colonial and some species were important reef makers during the Silurian and Devonian periods. Their skeletons were constructed primarily of calcite. 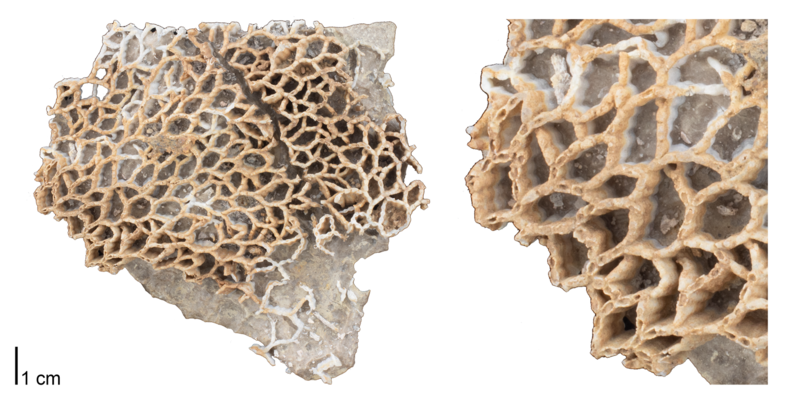 Some tabulate corals look superficially like honeycombs (e.g., Favosites), while others look like chain links (e.g., Halysites) or collections of narrow tubes (e.g., Syringopora). Others encrusted upon other marine invertebrates (including other corals). Examples of these and more are provided below. A portion of the "Sea Lily Reef" diorama at the Denver Museum of Science and Nature. A tabulate chain coral (Halysites sp.) is identified by the arrow. According to the Paleobiology Database, there are a total of 58 families of tabulate corals, 376 genera, and 511 species. 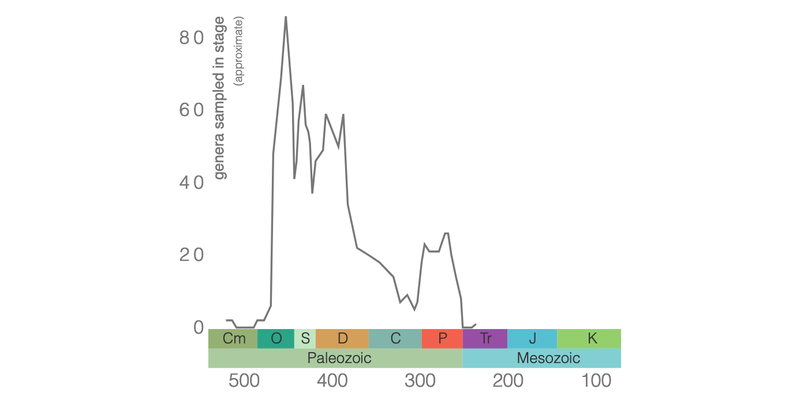 As demonstrated by the genus-level plot of their diversity through time (see below), tabulate corals suffered badly during the Late Devonian extinction event and never again reclaimed their former levels of diversity. The group went extinct at the end of the Permian period. Diversity of Tabulata genera based on data from the Paleobiology Database. The polyps of some modern hexacorals (or, scleractinian corals) harbor symbiotic algae called zooxanthellae that transform--through photosynthesis--sunlight into nutrients for the corals (learn more in the Hexacoral section of this chapter). Hexacorals are thought to have had this association with zooxanthellae as far back as the Triassic period, when they first appeared. What about Paleozoic corals? 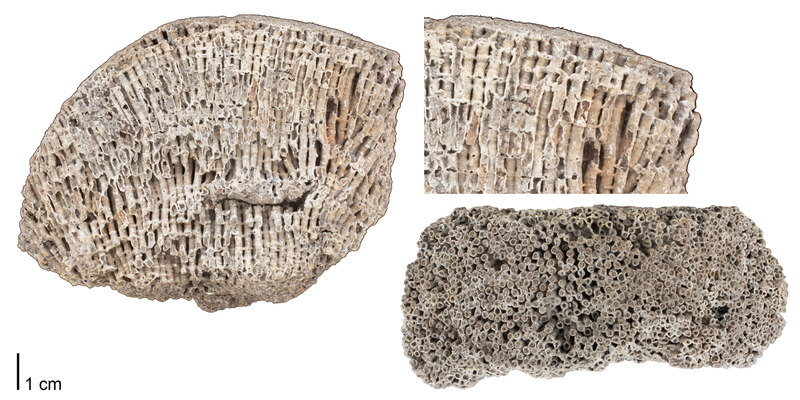 In a recent study, Zapalski (2014) studied isotopes of oxygen and carbon derived from the skeletons of Silurian to Permian tabulate corals (including species of Favosites, Syringopora, and Aulopora; see examples below) and found that some specimens had isotopic values consistent with those of modern hexacorals that harbor zooxanthellae. 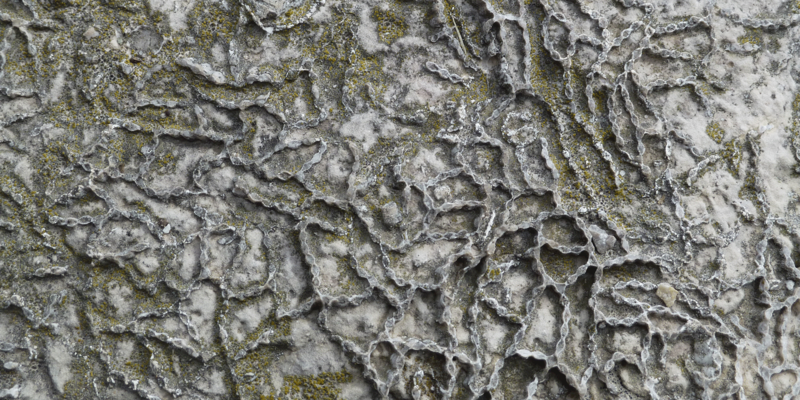 This suggests that some Paleozoic tabulate corals harbored photosynthetic zooxanthellae, just like some modern corals. This association appears to go back at least as far as the Silurian. A defining feature of most tabulate corals is the presence of structures called tabulae, which give them their name. Tabulae (singular, tabula; from the Latin for board or tablet) are horizontal plates that span across individual corallites (the spaces occupied by a single, living polyp). They are deposited by polyps as they grow, separating the living animal from the space(s) that were occupied earlier in life. Remarkably, we know something about the soft polyps of tabulate corals due to the discovery of calcified polyps in specimens of Silurian Favosites from the Jupiter Formation of Quebec. This discovery was reported by Copper (1985), who reported that individual corallites typically had 12 tentacles, though some had 11 or 13. The discovery of these polyps also confirmed that Tabulata are indeed Cnidarians, rejecting the hypothesis of some earlier workers that this group belonged with the sponges. Unlike rugose and scleractinian corals, most tabulate corals did not have septa. In cases where septa are present, they are usually very small (see example of Protarea richmondensis below). 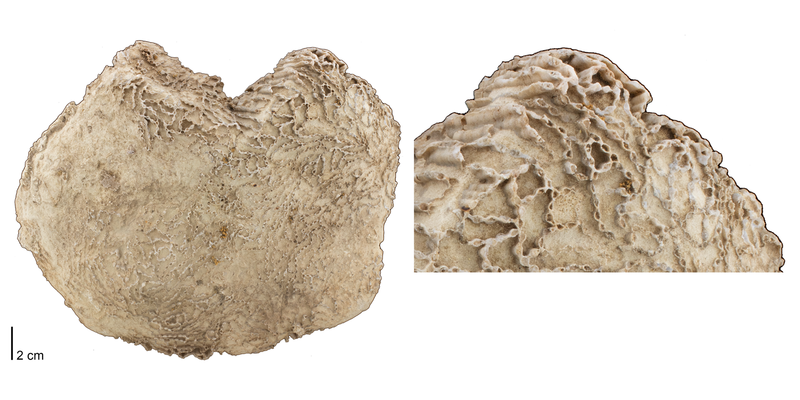 As a general rule, identifying whether or not a specimen of colonial Paleozoic coral has septa is a good indication as to whether it is a rugose coral (septa always present) or a tabulate coral (septa usually absent). As noted above, all tabulate corals were colonial, as demonstrated by the two specimens shown immediately below. The association and configuration of corallites relative to one another, however, varied considerably between different groups of Tabulata (see examples below). 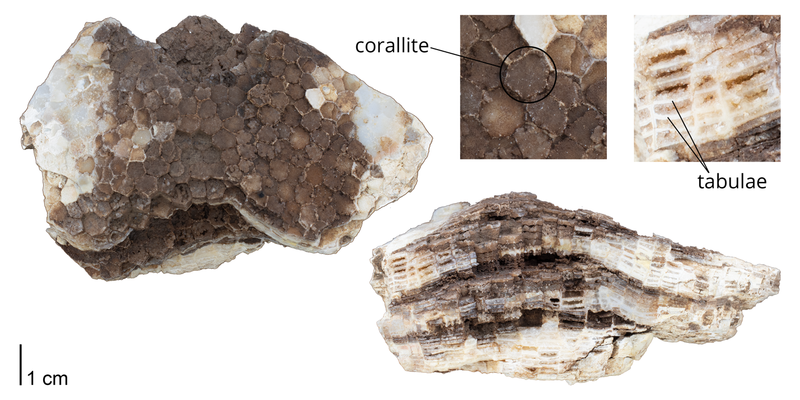 Corallites and tabulae identified on a specimen of Favosites favosus. Note the absence of septa. Specimen is from the collections of the Paleontological Research Institution, Ithaca, New York. 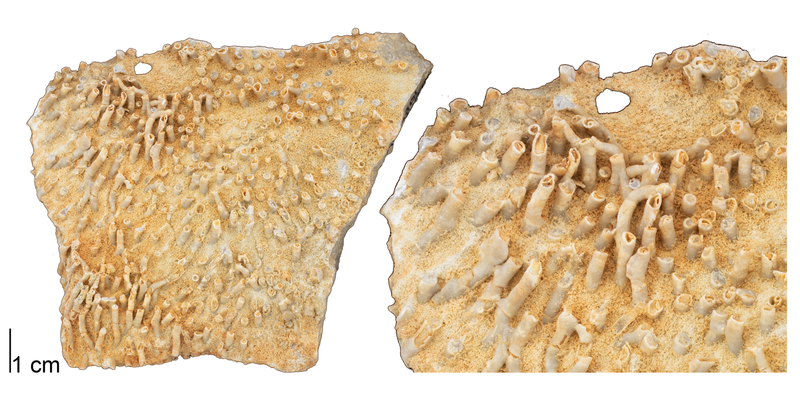 Corallites identified on a specimen of Halysites gracilis. Specimen is from the collections of the Paleontological Research Institution, Ithaca, New York. 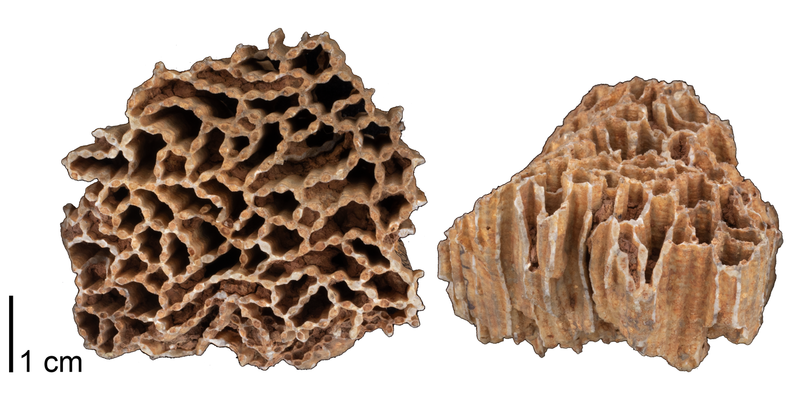 Note that the coralites of the specimens shown below have polygonal shapes, giving them a honeycomb-like appearance. Favosites favosus from the Silurian of Delaware County, Iowa. Specimen is from the collections of the Paleontological Research Institution, Ithaca, New York (PRI 76737). An interactive 3D model of this specimen is shown immediately below. 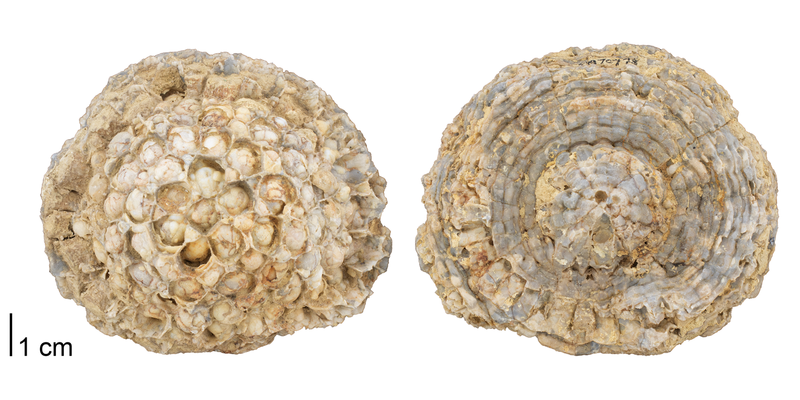 Interactive 3D model of Favosites favosus from the Silurian of Delaware County, Iowa (PRI 76737). Length of specimen is approximately 10 cm. Specimen is from the collections of the Paleontological Research Institution, Ithaca, New York. Model by Emily Hauf. A photograph of this specimen is shown above. Emmonsia emmonsii from the Devonian Onondaga Limestone of Genesee County, New York (PRI 76736). Specimen is from the collections of the Paleontological Research Institution, Ithaca, New York. An interactive 3D model of an additional specimen from this lot is immediately below. 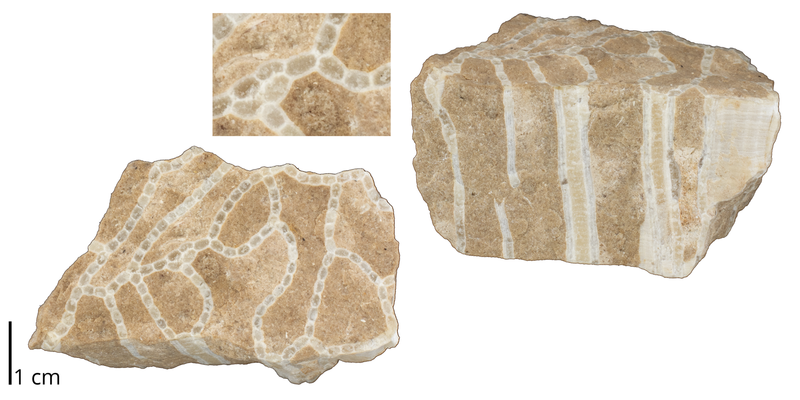 Interactive 3D model of Emmonsia emmonsii from the Devonian Onondaga Limestone of Genesee County, New York (PRI 76736). Specimen is from the collections of the Paleontological Research Institution, Ithaca, New York. Photographs of an additional specimen from this same lot is above. Model by Emily Hauf. Interactive 3D model of Favosites tuberosus from the Devonian Onondaga Limestone of Erie County, New York (PRI 54955). Specimen is from the collections of the Paleontological Research Institution, Ithaca, New York. Longest dimension of specimen is approximately 12 cm. Model by Emily Hauf. 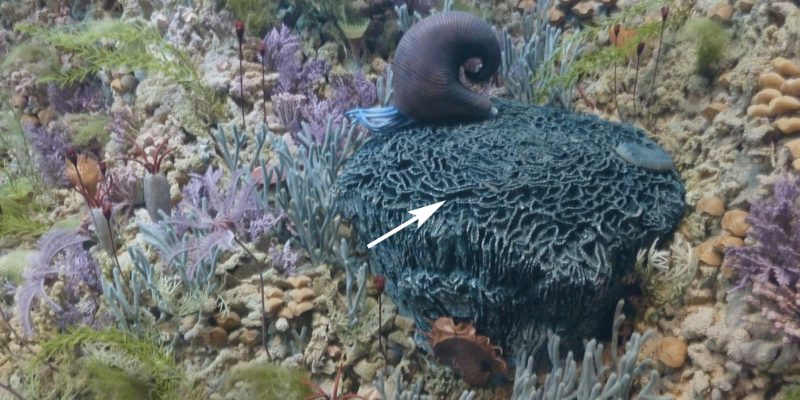 The corallites of the species shown below are linked on their edges, giving them a chainlink-like appearance. 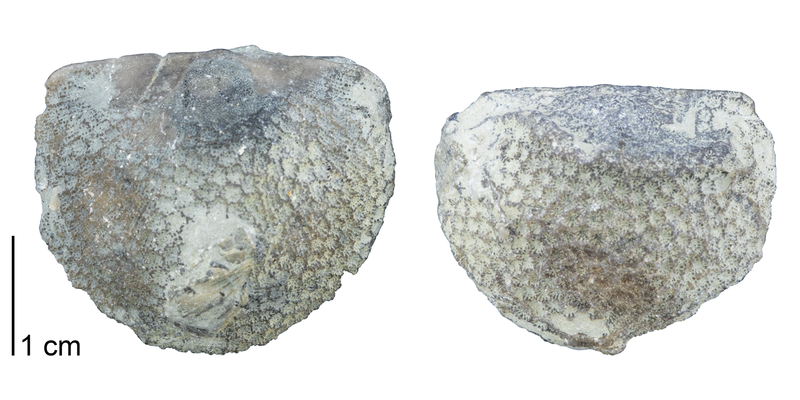 Halysites gracilis from the Ordovician Richmond Group of Winnipeg, Canada (PRI 76822). Specimen is from the collections of the Paleontological Research Institution, Ithaca, New York. Catenipora micropora from the Silurian of Jefferson County, Kentucky (PRI 76721). Specimen is from the collections of the Paleontological Research Institution, Ithaca, New York. A 3D interactive model of this specimen is immediately below. 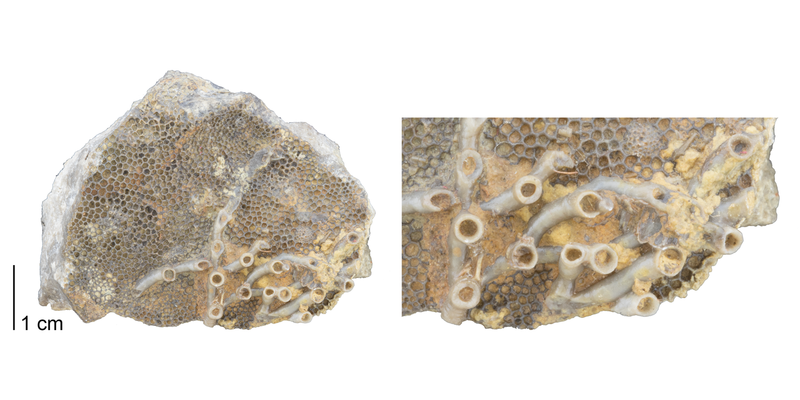 Interactive 3D model of Catenipora micropora from the Silurian of Jefferson County, Kentucky (PRI 76721). Specimen is from the collections of the Paleontological Research Institution, Ithaca, New York. Photographs of this specimen are above. Model by Emily Hauf. 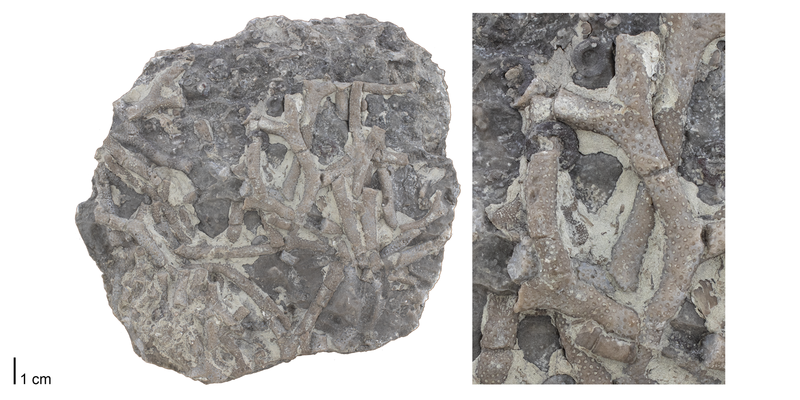 Halysites catenularia from the Silurian Niagara Group of Jefferson County, Kentucky (PRI 76738). Specimen is from the collections of the Paleontological Research Institution, Ithaca, New York. An interactive 3D model of this specimen is immediately below. 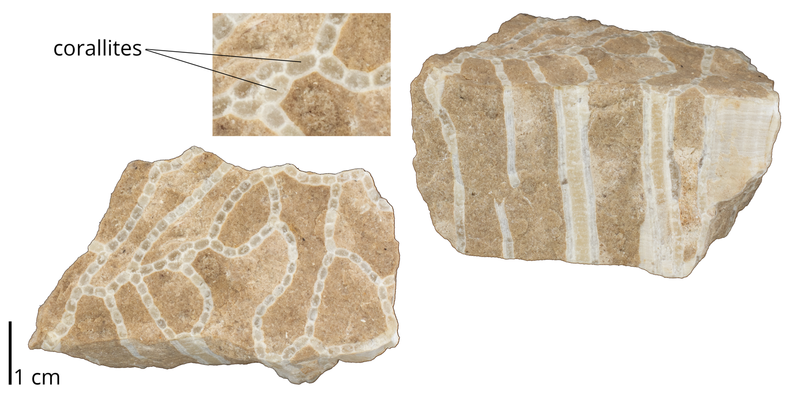 Interactive 3D model of Halysites catenularia from the Silurian Niagara Group of Jefferson County, Kentucky (PRI 76738). Specimen is from the collections of the Paleontological Research Institution, Ithaca, New York. See photos of this specimen above. Model by Emily Hauf. 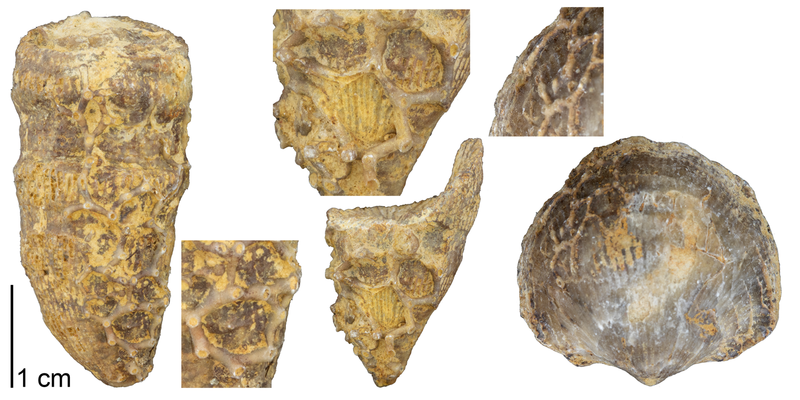 Halysites catenularia from the Silurian of Illinois or Wisconsin (PRI 70775). Specimen is from the collections of the Paleontological Research Institution, Ithaca, New York. An interactive 3D model of this specimen is immediately below. Interactive 3D model of Halysites catenularia from the Silurian of Illinois or Wisconsin (PRI 70775). Specimen is from the collections of the Paleontological Research Institution, Ithaca, New York. Photographs of this specimen are above. Model by Emily Hauf. 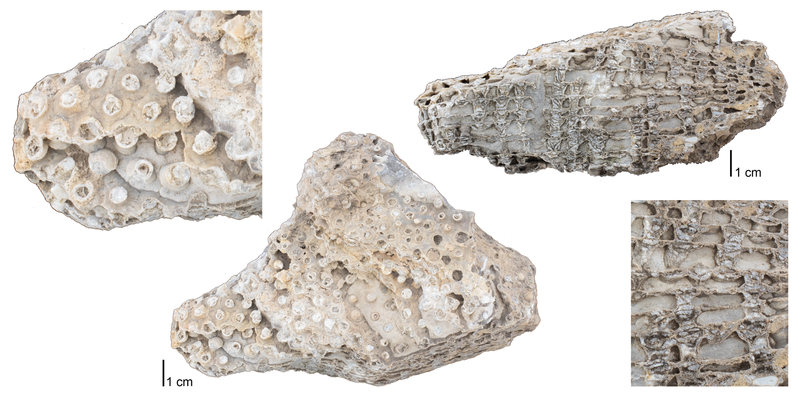 A specimen of chain coral (Halysites sp.) from the Silurian of Door County, Wisconsin. Fossils like this are very common in the carbonates of the Niagara Escarpment. These tabulate corals were not "free living." Instead, they grew upon the skeletons of other animals (including other corals). Aulopora saxivadum from the Devonian Hackberry Formation of Rockford, Iowa (PRI 76816). Specimen is from the collections of the Paleontological Research Institution, Ithaca, New York. Aulopora sp. encrusting upon Favosites sp. Fossil is from the Devonian Ludlowville Fm. of East Bethany, New York (PRI 76815). Specimen is from the collections of the Paleontological Research Institution, Ithaca, New York. Aulopora sp. encrusting upon Favosites sp. Fossil is from the Devonian Ludlowville Fm. of Genesee County, New York (PRI 76739). Specimen is from the collections of the Paleontological Research Institution, Ithaca, New York. See photographs of this specimen above. Interactive 3D model of Aulopora sp. encrusting upon Favosites sp. Fossil is from the Devonian Ludlowville Fm. of Genesee County, New York (PRI 76739). Specimen is from the collections of the Paleontological Research Institution, Ithaca, New York. See photographs of this specimen above. Model by Emily Hauf. 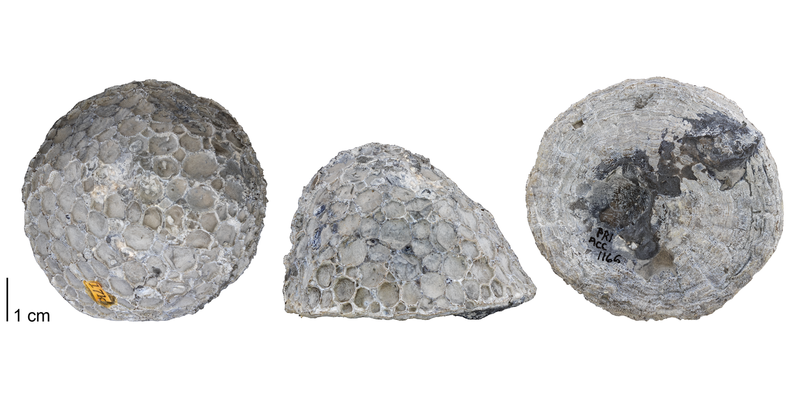 Protarea richmondensis encrusting upon brachiopod specimens. Note the small septa that are present within individual corallites. Fossils are from the Ordovician Richmond Group of Oxford, Ohio (PRI 76817). Specimen is from the collections of the Paleontological Research Institution, Ithaca, New York. Pleurodictyum americanum from the Devonian Moscow Formation of Ontario County, New York (PRI 76811). Specimen is from the collections of the Paleontological Research Institution, Ithaca, New York. Pleurodictyum sp. from the Devonian Onondaga Limestone of Ontario, Canada (PRI 70773). Specimen is from the collections of the Paleontological Research Institution, Ithaca, New York. Chonostegites sp. from Niagara County, New York (PRI 76819). Specimen is from the collections of the Paleontological Research Institution, Ithaca, New York. 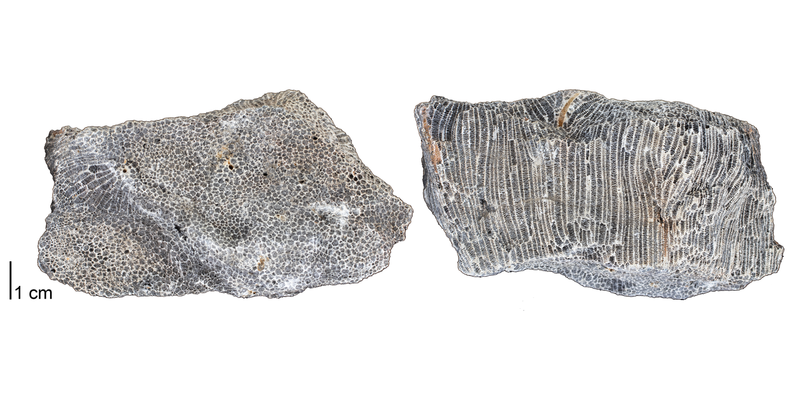 Syringopora geniculata from the Lower Carboniferous (Mississippian) of Derbyshire, England (PRI 76820). Specimen is from the collections of the Paleontological Research Institution, Ithaca, New York. Syringopora hisingeri from the Devonian of Logan County, Ohio (PRI 76818). Specimen is from the collections of the Paleontological Research Institution, Ithaca, New York. Cladopora sp. from the Devonian Onondaga Limestone of Williamsville, New York (PRI 76821). Specimen is from the collections of the Paleontological Research Institution, Ithaca, New York. Copper, P. 1985. 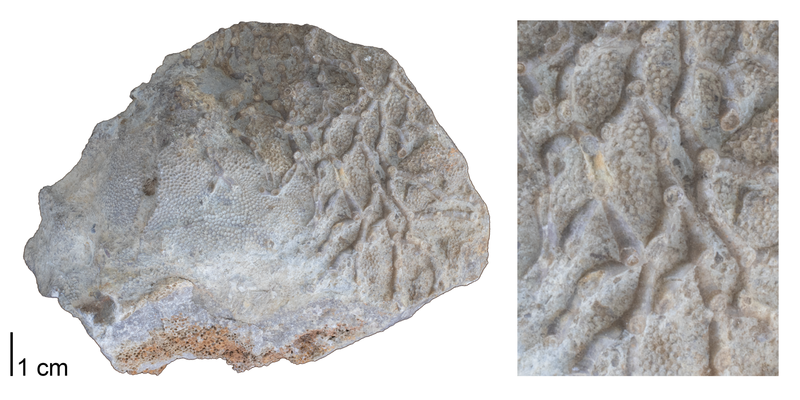 Fossilized polyps in 430-Myr-old Favosites corals. Nature 316: 142-144. Moore, R. C., C. G. Lalicker, and A. G. Fischer. 1952. Invertebrate Fossils. McGraw-Hill Book Company, Inc., New York, 766 pp. Shrock, R. R., and W. H. Twenhofel. 1953. Principles of Invertebrate Paleontology, Second Edition. McGraw-Hill Book Company, Inc., New York, 816 pp. Zapalski, M. 2014. Evidence of photosymbiosis in Palaeozoic tabulate corals. Proceedings of the Royal Society B 281: 20132663.